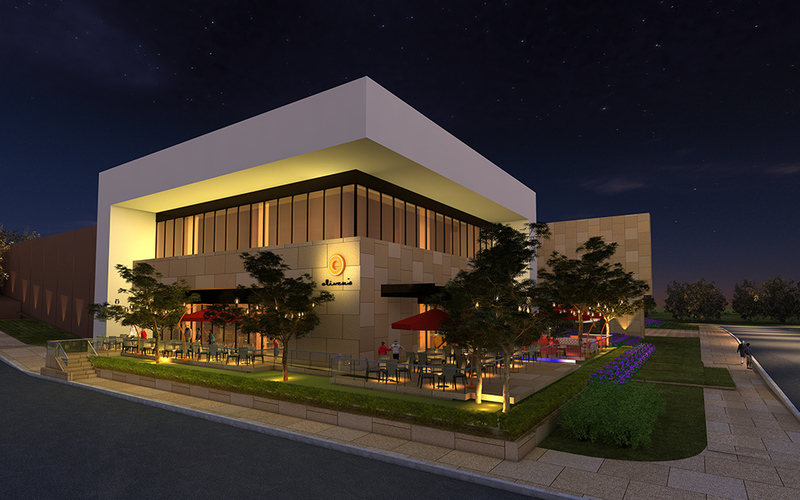 Rising out of the Sierra Nevada foothills, this proposed gaming facility is a low-rise building of approximately 72,000 SF (55,000 SF Main Floor and 17,000 SF Mezzanine Floor). The main floor is designed to accommodate 950 slot machines and 20 gaming tables, with a total gaming floor area of 25,000 SF. Dining amenities will include a three meal casual restaurant that opens to an expansive patio offering outside dining as well as fire pit seating. Stage areas located both inside and outside will accommodate evening entertainment. Additional amenities will include a food court comprising of four outlets with a themed dining area as well as a coffee and pastry outlet. The Main Floor will also accommodate some of the Back of House functions such as player services, kitchen areas and warehouse space. The mezzanine will accommodate the employee dining area, mechanical space and the balance of the Back of House functions such as administration, surveillance and low voltage server rooms. The exterior features large contemporary overhangs with stone accents at the entrances, dramatic water wall, infinity pool at the restaurant patio and plantings. Proposed parking facilities are comprised of 1,000 surface parking spaces adjacent to three entrances to the gaming and entertainment facility. Bus loading/unloading is accommodated immediately adjacent to the entrance near player services. Site development will include water and wastewater treatment plants, site utilities, retaining walls, extensive landscaping with site lighting and water feature near the main entrance. Off-site road improvements required as part of the project include: reconstruction of 3.5 miles of county roadway and signalization of three state highway intersections. Challenges: It took major effort over a period of seven years to obtain the environmental permits required for the project. The site is particularly challenging, requiring major cuts and fills along with a series of retaining walls - some approaching sixty feet in height.